Limpsfield Combustion is an industrial burner manufacturer, offering complete solutions to combustion requirements from standard burners to individually engineered solutions. Experienced in all common aspects and many more specialized areas of its field, Limpsfield offers experience, quality and competitive prices. Limpsfield Burners are of an Industrial Forced Draft design, suitable for alternative or simultaneous firing of all types of gaseous fuels and mineral fuel oils. Limpsfield Combustion offers burners for a range of application inputs from 1 – 100 MMBtu/hr. Designed and manufactured to exacting specifications, the Limpsfield burner line is an exceptional combination of form and function. Every feature, from the powder coated finish to the sealed damper bearings and large viewing port, exemplifies the commitment to quality and performance. With the ability to orient both the fuel and air inlets independently of one another the application possibilities are virtually unlimited. The Limpsfield burner range has also been designed with the service engineer in mind. All of the components can be removed or adjusted with only a few simple hand tools and without removing the burner from its mounting. In addition to being easy to set up and adjust, the unique forced draft combustion design distributes the combustion air in the burner head so that the necessary static pressure is maintained for stable combustion and flame geometry, throughout the complete burner firing range. Flame viewing port located at the rear of the burner, enabling a unique view of the combustion process. Fuel input fixings on either side of the burner, allowing flexibility for site conditions. Fitted terminal box from which a 32 way socket connects the burner to a control unit, allowing it to be disconnected and isolated when required. Stainless steel diffusers and blast tubes. Damper to control air input mounted using sealed bearings for improved control and reliability. Oil control on the burner is hydraulically operated to ensure absolutely no after burn, this is achieved using a piston controlled shut-off valve closing directly on the oil nozzle outlet. The hydraulic circuit is operated on a 25 bar supply pressure. Nozzles are made of high-alloyed steel to ensure the best possible burn out behavior for variable oil quality. The amount of oil supplied to the nozzle is controlled by a spillback type oil valve on the nozzles return line. Gaseous fuel is injected at high velocity into the air stream prior to the stainless steel mixing diffuser. The natural gas input volume is controlled via a precision made flange butterfly valve enabling one positioning motor to be used for both fuels. A completely linkageless procedure. Limpsfield Combustion also manufacture Gas Control Trains. These are supplied complete with pilot control train, double block control valves, regulators and isolation valves. Optional equipment includes: gas filters, pressure proving equipment, high pressure shut-off valves, gauges and switches. 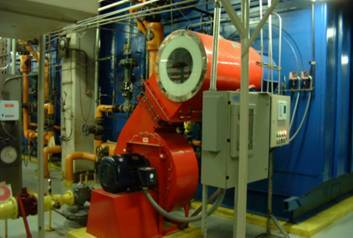 All burners are capable of meeting tough US federal codes regarding low NOx emissions. Numerous installations of this nature have been made with excellent results. Sub-30ppm NO emissions at 3% O2 can be attained. This is due to the utilisation of flue gas re-circulation and the superior flame retention and mixing achievable from the Limpsfield design. Limpsfield offers its users control panels to accompany the burners. These are designed and built around advanced combustion control equipment which will optimize reliability and performance of the LC burner. All panels are UL approved and built in an ISO9001 environment. In addition, panel design and specification can be tailored to the end user’s specific requirements.